Thank you for your trust in us and for buying your new Energy MP4 Touch Bluetooth. We hope you enjoy it. MP4 player with Bluetooth technology and built-in FM radio to listen to your music wirelessly. Do not expose your Energy MP4 to impacts, dust, direct sunlight, moisture or high temperatures. Do not use corrosive nor abrasive cleaning products. Keep the device clean and free of dust using a soft and dry cloth. Charge the battery when the display shows the low battery icon. Do not disassemble the device. All repairs should be exclusively done by qualified staff of Energy Sistem Technology, S.A.
MicroUSB to charge the battery and connection to the PC. USB cable to charge the battery and connect the device to the PC. Turn on and off your Energy MP4 Touch by moving the On/Off/Lock (4) switch upwards and keeping the position for 2 seconds. To lock/unlock the device, move the On/Off/Lock switch (4) to the corresponding up/down position. Connect the microUSB cable to the USB port (11) and proceed to connect the other end of the cable to a computer or any other device with USB port to charge the battery. Your Energy MP4 has a rechargeable lithium battery. To enhance battery life, please charge the battery completely before using the device for the first time. In order to charge the battery, connect your music player to your computer USB port. The charging time ranges from 2 to 3 hours, depending on whether the music player is on or off. In order to keep the battery in perfect condition, we recommend to switch it off or not to use the device while charging the battery. Please do not leave the device charging for more than 8 hours. Your Energy MP4 can extend the battery life in two different ways: the display turns off after a few seconds of inactivity or turns off completely after a few minutes of inactivity. You can adjust the time of both functions if you go to 'SETTINGS -> Screen settings" or "SETTINGS -> Auto shutdown -> Standby". In order to unlock the screen, move briefly the On/Off/Lock switch (4) upwards. To extend the battery life of your device, we recommend not to disable these power saving systems completely. Note 1: We recommend not to store or leave your device unused for long periods of time with an empty battery. Note 2: If your Energy MP4 Touch does not react or if your computer does not recognize the device, you can always restart the system inserting a sharp pointed object into the microphone connection. 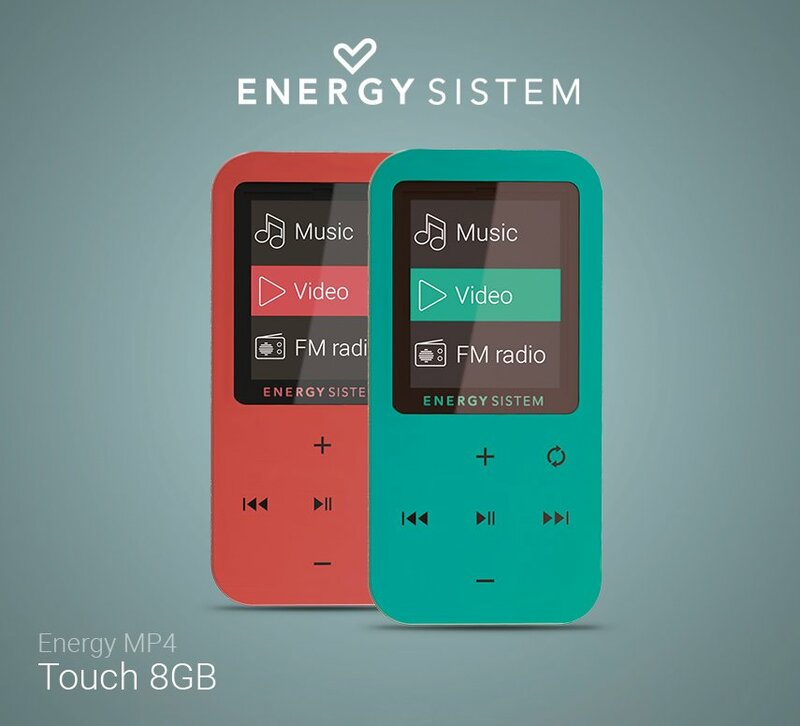 Your Energy MP4 allows you to enjoy music in MP3 / FLAC / WMA / WAV formats thanks to its high-fidelity sound processor. To access the music playback menu, select the 'MUSIC' option in the main menu and then press Play / Pause (7). To start, pause or restart the music playback press the Play / Pause button (7). Press briefly the Back (8) and Next (5) buttons to change to the previous/next track respectively. You can also rewind / fast-forward the song by pressing and holding the Back (8) / Next (5) buttons respectively. You can access the different playback settings by pressing the MENU (1) button. Move from one option to the next using Volume + (9) and Volume - (6) and use the Play / Pause (7) button to select. To exit the options menu, press MENU (1) briefly, or keep it pressed to return to the main menu. The playback order of songs depends on the selected mode. Selected mode by default is "Normal". You can choose your favourite mode through this option: "Repeat one" (it repeats the current track), "Folder" (it repeats just the tracks in the current folder and then stops), "Repeat folder" (it repeats the tracks in the current folder), "Repeat all" (continuous playback of all tracks), "Random" (all tracks are played in a random order) and "Intro" (it plays just the first 10 seconds and then switches to next track). This option will allow you to equalize the audio according to your preferences. Among the 7 available modes are: "Normal", "Rock", "Pop", "Classic", "Soft", "Jazz" or "Bass". Replay from A to B: You can continuously repeat a segment of a song with this function. To do so, press shortly the Volume + (9) button to mark the start of the playback (point A) and press again Volume + (9) to mark the end (point B). To cancel this function, press briefly the Play / Pause (7) button. Use this option when you store or delete songs to create again playlists by album, artist or genre. Notice: When you disconnect the MP4 player from your computer by using the safely remove hardware option, your 'MP4 Touch' will 'refresh' automatically and will continue in charging mode. With this option you will see all songs stored on your Energy MP4 memory, sorted alphabetically by file name. "Album", "Artist" and "Genre": You will see the list of your favourite music sorted by album/ artist/ genre respectively. Notice: In order to see audio files in those lists, the details concerning the artist, the album or the title must be registered in the file (these details are known as ID3-Tags). There are many free programs to create or modify the ID3-Tags such as "MP3 Tag" or "ID3 Renamer"
Notice: The song lyrics are text files named exactly after the music file but adding the LRC extension. If your songs do not contain this LRC file, lyrics will not be displayed, but you will be able to listen to the music without problems. If the song contains the lyrics (LRC file), they will be displayed on the screen, otherwise the Equalizer will be shown instead. This option allows you to browse the folders of your MP4 Touch internal memory or microSD external memory and select the music file you prefer, just like you would do from your computer. Delete file: This option allows you to delete the current song. Delete all: This option allows you to delete all songs stored on the internal memory. This function allows you to directly choose the folder and the music / video / image file you would like to be played, previously sorted on your PC. You can browse your folders in Music / Video / Photo mode. Please keep in mind that while you are browsing the folders in a specific section, only the file types associated to that section will be displayed (music files with Music, image files with Photo, etc.). In order to see all the files stored on the internal memory at the same time, choose the Folders option in the main menu. With Volume + (9) and Volume - (6) buttons you can select the previous/next folder or file. With the Play / Pause (7) button you will be able to access the selected folder or file. To go back in the folder navigation menu, press MENU (1) briefly, or press it and hold it to return to the main menu. Your MP4 Touch has an integrated FM Radio with some presets and direct recording option. To listen to the radio, select the FM Radio option in the main menu. The MP4 player will be in the same station it was the last time you used it. With the Next (5) / Back (8) buttons you can browse the frequencies range. By pressing these buttons you will move one step forward or backward and, by pressing and holding the button, you will start the auto search. Press the Play /Pause (7) button to change from one saved station to another. This way, you can browse all your saved stations. You can access the radio options submenu by pressing the MENU (1) button on the the FM radio frequency screen. Move from one option to the next by using the Volume + (9) and Volume - (6) buttons and use the Play / Pause (7) button to select. Press and hold the MENU (1) button to exit the options submenu. Save: This option allows you to save the current station in the next free preset. If all presets are taken, the station won't be saved. The current station will be saved in the internal memory of the device as "01". Repeat this process to list up to 20 stations in the order you prefer. Record: You can record the FM radio broadcast on WAV audio files. To start recording, select this option with the Play / Pause (7) button. You can pause the recording by pressing briefly Play / Pause (7) and resume it later by pressing again Play / Pause (7). You can access the recording options by pressing and holding the MENU (1) button while the FM Recording screen is on: recording destination (internal or external memory) and recording quality. To finish the recording keep the MENU (1) button pressed. Delete: This option allows you to delete the current preset. Delete all: This option allows you to delete all the presets. Auto Search: It scans the frequency range and stores the first 20 stations found in the presets. Press and hold the MENU (1) button for a few seconds to return to the main menu. Once in the main menu, the FM radio reception will finish. Your MP4 Touch enables you to perform voice recording thanks to its integrated microphone. To access the voice recording mode, select the Record option in the main Menu with the Play / Pause (7)* button. After that, press the Play / Pause (7) button to start recording. You can pause the recording by pressing briefly Play / Pause (7). Press the MENU (1) button for a few seconds to finish the recording. The sound files recorded are stored inside the RECORD folder. The files are in WAV format. To listen to these files, access the RECORD folder (previously stored in the internal or external memory) in the main menu. You can also access the RECORD folder by using the folder navigation function while you are in Folder mode, then select the WAV file you would like to listen to and press Play / Pause (7). Exit the RECORD mode by keeping the MENU (1) button pressed. View and enjoy your BMP / JPG / GIF images and photos thanks to the TFT high-resolution screen of your MP4 Touch. To view your images, select Picture from the main menu. You will access directly the file explorer (check the Folder section), then choose the picture you want with Volume + (9) and Volume - (6) and press the Play / Pause (7) button to view it. Press briefly the Back (8) and Next (5), buttons to change to the previous/next image respectively. Access the option submenu by pressing the MENU (1) button. The Playback set option in the submenu allows you to set the playback mode (auto or manual play). Press and hold the MENU (1) button for a few seconds to return to the main menu. Your MP4 Touch makes the music grow to a new level since you can enjoy your favourite music videos at any time and in any place. You can play AVI/WMV/MPG/VOB/ASF videos previously converted to the AMV format with the AMV video Converter software, which is included in the MP4 player memory. Check the user manual AMV VIDEO CONVERTER section. To play videos, select the Video option in the main menu. Press briefly the Back (8) and Next (5), buttons to change to the previous/next video respectively. You can also rewind/fast-forward the current playback by pressing and holding the Back (8) and Next (5) buttons respectively. Access the option submenu by pressing the MENU (1) button. Move from one option to the next by using the Volume + (9) and Volume - (6) buttons and use the Play / Pause (7) button to select. This option allows you to browse the folders of your MP4 Touch internal memory or microSD external memory and select the video file you prefer, just like you would do from your computer. Delete file: This option allows you to delete the current video. Delete all: This option allows you to delete all videos stored in the internal memory. Repeat: This option enables you to set the playback order of videos (Repeat one, Repeat all, Random, Repeat folder, etc.). To return to the video you were watching, press briefly the MENU (1) button. Press and hold the MENU (1) button to return to the main menu. The easy AMV Video Converter software will allow you to convert your AVI/WMV/MPG/VOB/ASF videos to the AMV format and enjoy them in your MP4 Touch. Connect your Energy MP4 to your computer. Access the MP4 player memory and run the "Setup.exe" installation file directly from the "AMV Video Converter" folder. On the installation window, select "OK" and click on the icon to begin the installation. Press "Next" to follow the installation steps. Notice: Depending on the video codecs you have installed in your computer, the program may alert you when trying to overwrite the files. In that case, we recommend to select "yes" in order to keep the existing files in the computer. Once the installation is complete, you can run the application from "Start"->"All programs"->"Media Player Utilities"->"AMV&AVI Video Converter". Notice: In order to convert special video formats like MPEG4 / DivX / XviD / etc, make sure that you have the necessary "codecs" installed in your computer. You can install codec packages like "K-Lite Standard Pack". 1.Run "AMV&AVI Video Converter" from the "Start" menu. 2.Choose the file to be converted with the "Add file" button. 3.Select the destination folder for the newly created video by clicking on the "Video Path" button. Notice: If your Energy MP4 is connected to your computer, you can select a folder to store the new video directly in it, but first make sure that it has enough free memory available. 4.Click on the "Add file" button to add another video to the conversion queue. Notice: You can add many conversion tasks to convert automatically several videos without having to keep an eye on your computer. You can also delete a queued task by selecting the line with the mouse, clicking with the right button and pressing "Delete". 5.Repeat steps 2 to 4 for each video you would like to convert. 6.Once you have queued all the videos you want to convert, press "Begin" to start the process. 7.In the "Status" column you can see the file that is currently being converted. You can see the state of conversion of a given task on the "Progress" bar. Wait until all the queued tasks are finished and click on the "Close" button to exit the program. Notice: It is advisable not to use the computer while Video Converter is working since it requires a good amount of resources and it could cause the application to stop responding. 8.Connect your MP4 Touch to your computer (check "PC CONNECTION" section) and copy the new AMV files to the folder of your choice, unless you have previously chosen the new videos to be directly stored in a specific folder. You can configure many aspects of your MP4 'Touch' very easily. To do that, access Settings from the main menu. Move from one option to the next by using the Volume + (9) and Volume - (6) buttons and use the Play / Pause (7) button to select. UI version: You can change the device interface. Coral, Grey or Mint versions are available. LCD set: With the Dark mode option, you will be able to adjust the time until the display turns off automatically when any button is pressed. Choose '0' seconds for the display to be always on. Language: You can switch the user interface language to Spanish, English, French, etc. It turns off completely after a period of inactivity. To do that, choose the option Off time. This option works in 'seconds'. Choose '0' seconds to ensure that the device will never turn off, not even when it is in sleep mode. It turns off after a given period, even while playing or when active. To do that, choose the Sleep time option. This option works in 'minutes'. Choose '0' seconds to ensure that the device never turns off. In order to enjoy the best sound and your favourite music on your Energy MP4, you have to copy these files from your PC to its internal memory first. Connect the MP4 player to your computer USB port through the USB connector and it will be automatically detected by your computer without installing any driver. Once it is detected, you will be able to read/write on the device memory, just as if it was a regular drive. Once the data transfer is finished, disconnect the MP4 player from the computer. IMPORTANT: To prevent data loss, always remove the USB device safely before disconnecting the MP4 player. In Windows XP, for instance, the safely remove hardware icon is on the start taskbar, near the clock. Your Energy MP4 has an operating system installed, commonly known as firmware, that sometimes needs to be reinstalled. If you find that the MP4 player is not responding, reboots randomly, or you have problems to access the memory content from your computer, try to press RESET by using a pin or a needle. If the problem persists, it will be a sign that the firmware has been damaged and needs to be reinstalled. 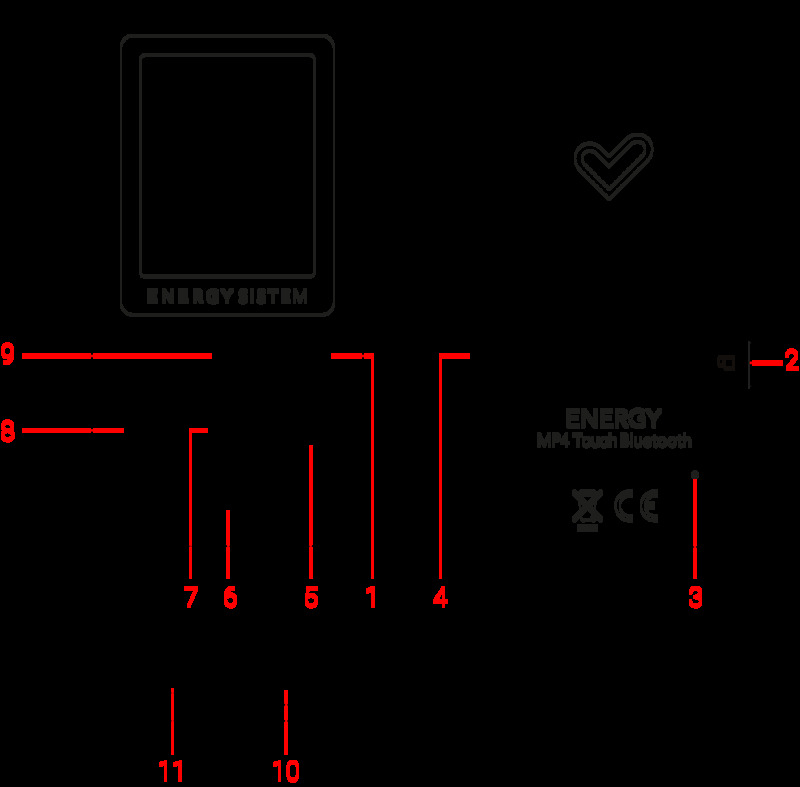 In order to reinstall the firmware, access manually www.energysistem.com from a web browser. Select your model in the product section and download the proper firmware version from the download area. Unzip the file in your computer and follow the instructions included in PDF format. Energy Sistem Technolgy, SA is liable for any lack of conformity which exists at the time the goods were purchased during a period of 36 months. Batteries are excluded from the 36-month warranty, having a warranty period of 24 months. This warranty covers any defects in workmanship or materials. This warranty doesn’t cover any failure of the product due to accidents, misuse or alteration made by an unauthorized person. The special 36-months warranty is valid for the European Union. For other countries, please refer to your specific legislation or your local distributor. drivers and updates available. The solution to your problem is very likely to have been already published there. Alternatively, you may prefer to contact the distributor from which you purchased the product, presenting the purchase receipt or invoice. Important: This warranty doesn’t cover any damage or loss to any data stored in the product memory, therefore Energy Sistem’s Technical Service will not assume any loss of the above mentioned information so it is recommended to make a backup of your data and to remove any data or personal info from its internal memory before you send the product, or to send it only with the original factory default values. Trademarks. All companies, brands and product names are trademarks or registered trademarks of their respective companies. © 2015 by Energy Sistem Technology, S.A. All rights reserved. Manufacturer name: Energy Sistem Technolgy, S.A.
in conformity with the essential norms and standards of the Directive 2014/53/EU of the European Parliament and of the Council of March 16th April 2014.